Help: How Can the Newly Passed ABLE Act Help My Family? Thank you for the question. 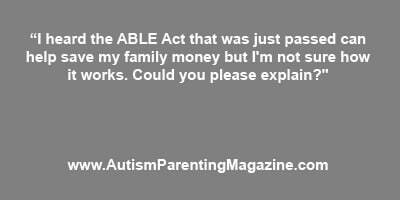 The ABLE Act was passed at the end of 2014. The ABLE Act allows individuals who were deemed disabled before the age of 26 to save money in specific accounts and not jeopardize necessary government benefits. Before The ABLE Act was passed, an individual with a disability who relied on government benefits like SSI and Medicaid could not save more than $2,000 or else they would lose healthcare benefits, as well as home and community supports which would mean they could lose housing as well as job supports which would also cause a loss of employment. 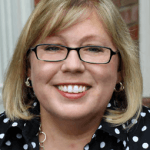 The ABLE Act and the resulting ABLE Accounts will provide individuals with a disability the same right to save money that those without disabilities have always enjoyed. The ability to work and save money provides a deep feeling of accomplishment, confidence and success. These feelings will help those with disabilities reach levels of independence not seen in the past. At this time, the ABLE account includes some drawbacks that, for the majority of families, does not lend itself to be the primary account for parents and grandparents to save their hard earned money with the hopes of providing financial resources for the future support of their loved one with special needs. For more information on how to prepare for the future, be sure to contact a financial advisor who specializes in serving families with special needs. A Special Needs Plan is driven by what they call Unleash L.I.F.E.™- L.I.F.E. meaning Lasting Independence For Everyone™. This is accomplished with education, action, and support in the creation, implementation, and continued monitoring of a specifically designed lifelong and integrated plan for your family: parents, caregivers, your loved one with special needs and their siblings. I’m still somewhat confused as to whether I need to get a separate account under the ABLE Act to save money for my son, who is on SSDI. Would I need to do that? And if so, what would I need to specifically ask for at the bank? Please feel free to contact A Special Needs Plan as they would be most qualified to respond. 704-557-9637 Thanks so much!